At today's Mortal Kombat 11 Reveal event, NetherRealm Studios gave us a sneak peek at the story mode for the latest instalment in the series. The trailer opens up with Raiden torturing Shinnok in the Jinsei Chamber, where Shinnok was attempting to drain the entire life force of Earthrealm in the story of Mortal Kombat X. The Thunder God, at the end of the last game, told NetherRealm rulers Liu Kang and Kitana that there were fates much worse than death, as he held the still breathing head of Shinnok. It turns out that this opening scene to the trailer took place moments before there, as he cuts off Shinnok's head, making that same statement. Raiden told the Elder God that he will serve as a warning to all who oppose him. As he left the Chamber, time seemed to stop around Shinnok. The rain froze in mid-air, and his head no longer seeped blood. A new elder god approached the beheaded Shinnok, claiming that he's not at his "destination arc." She then said that, once again, the Thunder God has "upset the balance of history." This was a reference to Mortal Kombat 9, where Raiden of the former games sent a message to his younger self prior to the beginning of the first Mortal Kombat tournament featuring Liu Kang, warning him of all that would happen in order to stop Armageddon. 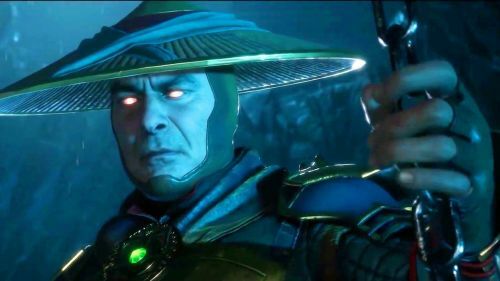 It seems that Shinnok was indeed supposed to take over Earthrealm, but after being stopped by Raiden and all of the Earthrealm warriors, someone new has stepped in to fix this mess. It's unknown who this new God is, but she's definitely not the sand/time warping new character Geras. What will happen now that Raiden has again upset the balance of time? Will his tyranny lead to the end of the Mortal Kombat Universe as we know it? Find out when Mortal Kombat 11 is released on PlayStation 4, Xbox One, Nintendo Switch, and Microsoft Windows on April 23rd!